There are three Bikeability levels, with each level designed to help improve their cycling skills, no matter what they know already. Levels 1, 2 and 3 take trainees on a journey from the basics of balance and control, all the way through to planning and making a journey by themselves on busier roads. Start and finish a journey by road, including passing parked or slower moving vehicles and side roads. Identify and react to hazards in the road. 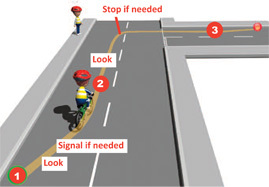 Signal your intentions to other road users when someone needs to know what you’re doing. 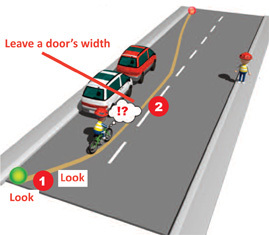 Understand where to ride on the road. Use junctions, including turning left and right into major and minor roads. Decide whether a cycle lane will help your journey. During Bikeability Level 3 training you will learn the skills to tackle more challenging roads and traffic situations. Level 3 training is often delivered one-to-one so can be tailored to your individual needs, such as your route to work or school. Make a trip to school, work or elsewhere on any roads. Use complex junctions and road features such as roundabouts, multi-lane roads and traffic lights. Know how (and when) to pass queuing traffic. Identify and react to hazardous road surfaces. The rules of cycling have changed. There are new turning and over taking techniques find out more below. 1. In the gutter we are more likely to get punctures or be forced to swerve to avoid debris, grids and potholes, to catch a pedal or tyre on the kerb when checking behind or to be overlooked or ignored by other road users. 2. In secondary position we avoid grids and debris, create safety space on both sides and wobble room when checking behind, let other road users know we are there and are happy to have traffic alongside (overtaking) whilst riding. 3. In primary position we improve our view and make ourselves much more visible to other road users, make our intentions clear by virtue of our position, have a greater influence on how other road users behave and do not want to have traffic alongside whilst we ride. 1. Check behind for a suitable gap in the traffic. When it’s safe, move out into primary position. Don’t get too close to the car before. As you approach the parked car, look for clues...Is somebody in the car? Are they indicating to pull out? Is the engine running? Use your senses and be ready to react! 2. 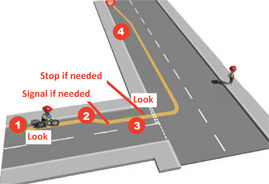 Stay in primary position to keep following traffic behind you and to let them know you mean to go straight on. Leave room in case somebody opens the door. When you can see it’s safe, move back into secondary position. 1. Check behind for a suitable gap in the traffic. When it’s safe, move into primary position. 2. Approach the junction in primary position Signal left before you reach the turn. Check ahead for oncoming traffic. 3. Stay in primary position around the turn to keep any following traffic behind you. 4. When you can see it’s safe, move back into secondary position. 1. Check behind for a suitable gap in the traffic. When it’s safe, move into primary position. Drift don’t swerve. 2. Slow down as you approach the junction. Signal left if there is traffic behind you. 3. 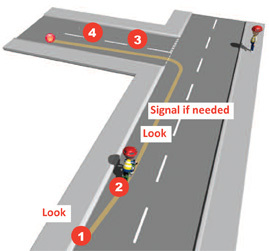 At the junction, position yourself so that you can see clearly in both directions. Check both ways and wait for a safe gap in the traffic before moving off. 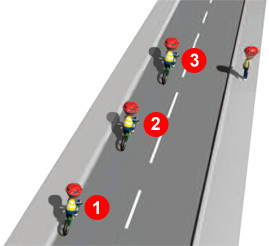 Stay in primary position around the turn to keep any following traffic behind you. 4. When you can see that it’s safe, move back into secondary position. 1. Check behind for a suitable gap in the traffic. When it’s safe, move out into primary position. Signal right. 2. Check ahead for oncoming traffic as you approach the junction. Keep signalling. If there is a safe gap in the traffic, go straight round in primary position. Don’t cut the corner. On busy roads, you may have to wait for traffic to pass before you can turn. Wait opposite the junction, in line with the centre of the road. On wide roads, leave enough room for traffic behind to get past. Keep signalling until you have time to cross. 1. Check behind for a suitable gap in the traffic. When it’s safe, move out into primary position. Slow down as you approach the junction. Check for traffic on the major road. 2. At the junction, position yourself so that you can see clearly in both directions. Check both ways and wait for a safe gap in the traffic before moving off. Signal if necessary. 3. Stay in primary position around the turn to keep any following traffic behind you. When you can see it’s safe, move back into secondary position. 1. Frame and Forks - There should be no cracks or excessive rust on the frame. If there is then the bike should be checked at a bike shop. 2. Saddle - Your child should be able to sit on the saddle and touch the ground with the balls of both feet, if the feet are flat on the floor then saddle may need raising. The safety mark on the seat post should not be visible and the saddle should be tight. 3. Handlebars - The bars should be tight and not move up, down or sideways. The safety mark on the stem should not be showing. 4. 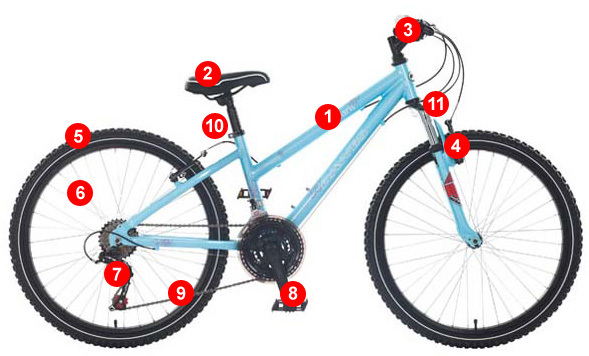 Brakes - Your child’s bike must have two working brakes to be road worthy. There are two main types in current use-rim brakes and disc brakes. For rim brakes, check that the brake blocks are not badly worn and that they align squarely with the rim. For disc brakes, check that the disc is not bent or otherwise fouling the brake pads. For both types, check that the brake levers are not too stiff or out of reach for your child’s hands. Check that the brake cables are securely attached and not excessively frayed or rusty. 5. Tyres - Check the tyres to see if they are pumped up enough by squeezing their sides. Check that there are no worn patches or splits. 6. Wheels - Check that both wheels run freely by spinning the wheel; if it does not spin but rubs against the brake blocks, you may need to get the wheel straightened or the brakes adjusted. Check that nuts or quick release levers that hold the wheel in place are tight. 7. Gears (where fitted) - Check that all gears can be engaged and that the chain does not get thrown off from the sprockets on the rear wheels. 8. Pedals - Check that the pedals are fixed on tight and spin freely. 9. Chain - Check that the chain is not very rusty and that none of the links are seized up owing to a lack of oil. 10. Reflectors - Check that there is a white reflector at the front and a red one at the rear. Check that they are clean, fixed securely and pointing in the right direction. 11. Lights - If riding at dusk or at night, your child’s bike must be fitted with a white light at the front and a red light at the rear. If lights are fitted, check that they work, are fitted securely and point in the right direction. 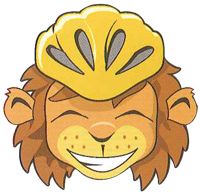 For maximum protection you should always wear a cycle helmet. It will help protect your head if you fall off your bike. Even the most experienced cyclists can have an accident. Seven out of ten cyclists who go to hospital after an accident have head injuries. Before you buy a helmet it must fit properly so make sure you buy one that's the right size and fastens correctly. Try it on before you buy it to check it fits, it should sit snugly on your head with little or no movement. Does yours? 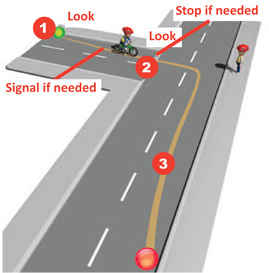 An easy way to remember how to check your helmet is fitted correctly is to follow the 1 - 2 - V method shown below. V. Make sure the straps make a 'V' shape around your ear. 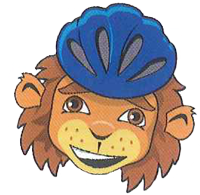 Click on the image to download the Let's Bike answer booklet. If you have completed the 2 wheeled crossword on page 2 of the booklet and found the hidden word. Simply complete the form below for your chance to win the cycling goodie bag.